Have you ever gotten bored playing Minecraft? Have you ever been stuck at your base, unable to go outside for the time being? Well then maybe you should consider Chass! Chass is a unique board game seamlessly integrated into Minecraft. The game is loosely based on chess. The name is a spin on the word (like purpur = purple). Now I know what you’re thinking, “chess has no place in Minecraft!”, but here me out. Chass has simpler rules that make it easier to learn, and even incorporates Minecraft characters. The general idea is to add a little fun feature to a big game. 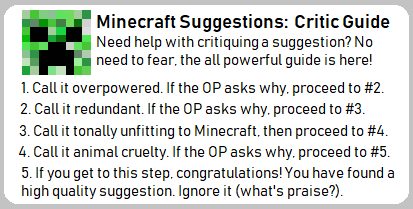 It’s completely optional, but I think once people get the hang of the game a separate playerbase might emerge (like survivalists, builders, and redstoners). To play Chass in survival mode, you’ll need to obtain a Chass Board. These boards can be found in dungeons or in libraries. The first time you ever open a board you will get a game tutorial, quickly explaining the rules. As I’ve said before, chass is a simple game to learn. You don’t even need to know chess to become a pro. The game is played on an 8 x 8 board of alternatingly colored squares. On the bottom side of the board is you, on the top is your opponent. Each side controls 16 pieces. Your pieces are surrounded by a gold trim, your opponent has a grayish iron trim. This is what the beginning of a chass match looks like. When you click on a table this interface will appear, and it will change accordingly as the game progresses. If you click on a chass board, you will begin a game. If you press the escape key, the game will pause. If you ever click on the board again you will be brought back to the previous game. Triple click to start a new match. Time still moves when playing a chass match, so you can use it to pass time while waiting for crops. Just remember to play somewhere safe. The first person to click the board will start the match. If they make their first moves with no one else present, they will play against an AI. The AI’s skill is adjustable in options, though by default it starts out weak and increases as the player gets a hang of the game (this adjustment can be disabled for everyone via gamerule on servers). But if another player joins right before a game begins, a multiplayer match will begin. The board is flipped for the second player, and they see themselves with a gold trim and the first player gray. The triple clicking restart requires both players in multiplayer matches. Multiplayer matches can be used for just a fun game, or on large servers for tournaments. So how do you win? Well, you must defeat your opponent’s leader, the piece with the face of a player. If you are playing in multiplayer the face will be that of your opponent’s skin. If you are playing an AI, it will be either Steve or Alex. If you are playing a librarian it will have a villager face (more on that later). Each piece has a set of health points. Each time one of your pieces attacks one of your opponent’s, the attacked will lose one heart. So if my zombie attacks Alex’s skeleton, the skeleton will lose one heart. Leaders are one of the strongest pieces in the game with four hearts. This is so that you have a chance at defending your leader after an attack. After the leader is defeated the game will end. So, does that mean none of the other pieces matter? No. You’ll need every piece you have to win. You shouldn’t be too reckless with any piece, especially stronger ones such as the enderman. Like many board games, each side has a turn. During a turn one may move only one piece. After moving said piece, they may use it to attack. Alternatively, they could attack form the get go and forfeit the chance to move. You can only move one piece per turn, and can only move where the piece can go. Now it’s time to meet the pieces! Zombie: The most basic piece. They can only move / attack in four directions once. There is a total of four zombies per side. They cannot move diagonally or more than once, and have no special ability. They have a mere two hearts. Spider: A bit better than the zombie, spiders are much faster, able to move two squares in the same direction. If there is a piece right in front of them, but an empty space two squares forward, they may “jump” over the square. However, they cannot attack or move diagonal. There are four per side, but each only have two hearts. Skeleton: Skeletons can move in all eight directions once, but their main strength is their bow. They have the only ranged attack in the game, able to shoot their arrow in any direction (as long as it’s straight and no one is blocking them). However, they cannot attack enemies within a one square radius of them. There are three skeletons per side, each with three hearts. Creeper: These guys move in all eight directions once, and like skeletons their strength lies in a specialized attack. Creepers can “explode”, which will destroy the piece but also cause damage to every piece in a one square radius (eight squares in total). This effects both enemies and allies, so take caution. Each side has three creepers, whom all have three hearts. Enderman: The strongest piece. They can “teleport”, aka move to any empty square within a three-square radius. There is only one piece per side, so use your enderman wisely (they have four hearts). The Player: The objective of the game, defend your player at all costs! Your player is always your skin, your opponents depend on who you are playing. They can move in all eight directions once and have four hearts. And that’s really it for how to play. I’ve thought up some strategies and opening moves, but those are all for people to discover and create on their own. As I’ve said before, chass would be a great addition to the Minecraft community, maybe even warranting its own subforum here. But chass isn’t just for fun. You can also use your chass skills to thrive in survival mode, just like one does now with fighting or exploring. In village libraries you have the chance of finding a chass table. If you click on this table (without destroying it) the librarian will walk over to you and challenge you to a match. The librarian may be of any skill, you have no way of knowing- so it’s probably for the best that you are more than familiar with the game before you challenge a librarian. Now, you can play a match with the librarian just for fun… or you could play for a purpose. The librarian will randomly choose to put down 1-3 emeralds. After he decides on a number, you will also have to supply the same number. The winner of the match will win all the emeralds, so if the librarian puts down 2 emeralds and you win the game you'll receive 4 emeralds as a reward (+2 emerald profit). On the other hand if you lose, the librarian will take all the emeralds! This is game changing for Minecraft. Let’s be honest here- right now on servers the only way to be the best is to have a knack at combat, or a lot of luck. There is way for the strategists to shine. Players would be encouraged to practice by themselves, and read up on strategies. Smart and determined players would be rewarded. Of course, you need an item first, so this wouldn’t take away from normal progression and exploration. To conclude, Chass is a dynamic new board game built into Minecraft. It can be played alone when bored, with friends for fun, on servers in tournaments, or with villagers for rewards. I think it would be a welcome addition to the Minecraft community and add a layer of intelligence that is honestly absent from the game now- all while maintaining a sense of fun. Frankly, this seems unnecessary. Why would anyone need a smaller game within their game? If somebody is stuck inside and bored, they can play with redstone, smelt some stuff, and possibly go do something else with their time while waiting for the sun to rise. If someone wants chess as a server game, they can install a plugin. No support; this has no reason to exist. Yes, you can already play with redstone or smelt. But just because you can already do a couple things doesn't mean we can't have more. By that same logic we shouldn't have brewing, because you can already play with redstone or smelt. Minecraft is basically just a bunch of things you can do, and chass would add to that list. Plus it encourages strategy and taking time to think, which is absent in minecraft today. And just because something is in a mod or plugin doesn't mean it can't be in the base game. I think this is a little unnecessary. I wouldn’t mind some sort of side card game similar to war to make villagers a little more in-depth, but this feels slightly overboard. I honestly don’t like the idea of the AI, as it makes little sense (who is playing with you?) and just makes it feel more like an app than something inside of Minecraft. Something that I think would be interesting is if this was a separate app you could download and link to a Minecraft world. Or, alternatively, this could be a real board game that you could buy in real life. Another issue is the betting. Though it may not seem bad, gambling could warrant a change to Minecraft’s rating. You could change this by having the villager say something like, “I need to improve my skills in Chass. If you show me some tricks, I will give you an emerald.” Then, if you win, you would get an emerald, and you would lose nothing if you lose. Overall, this seems unneeded and somewhat unfitting for the game. I’m going to have to say No Support. Yes, but brewing is a simple, practical use of time, whilst this game is elaborate and pointless. It's like buying a wedding cake and finding a bag of jelly beans inside: You might be unbothered, or even like jelly beans, but it's still a helping of "not-what-I-payed-for" in an unpalatable package. If people want the jelly beans, they can damn well get them themselves. Incorporating a game of strategy into Minecraft would be better accomplished as an elaborate trap in a temple or dungeon, rather than a complicated GUI game. Additionally, "strategy and time to think" are already in Minecraft. Redstone could be said to fill that niche, as building complex mechanisms with it is already an excercise in patience and problem solving. There is no need to shoehorn something that would be better as a separate product into the game. My opinion remains the same. In my opinion, brewing would be more complicated than chass. Brewing requires knowledge of dozens of recipes and require a good amount of time and experience to learn. Chass is the same way. Traps in dungeons don't require any thought, all you need is to look at the wiki. For example, the desert temple tnt trap is common knowledge to anyone who is familiar with the game. As for redstone, yes original creations require thought, but most things have already been figured out and posted online. Chass would not be broken like this, because each game is unique. Maybe Mojang could make some more money by selling this as a separate irl game. Like I mentioned above, that would be a lot better than integrating the game into Minecraft. They already have a unique Minecraft card game, so a board game wouldn't be off the table. Idk, i would like something like this. Maybe just "chess" though. I mean it isnt copyrighted, i dont think so atleast. 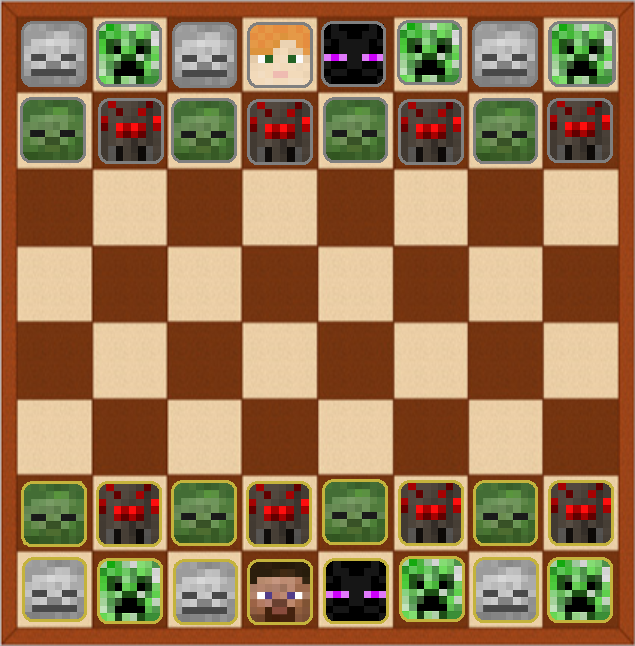 And if they wont do chess, just chess with minecraft mobs, just easier and more understandable than a entirley new game. Personally when it comes to minigames in MC I prefer them to be player-made with Redstone and commands. Minecraft is very much a game about creating your own fun after all. You're losing me. I don't understand the point you're trying to make here? I'm confused... how could this be made on maps? The only way I could see this on servers is with a server plugin. Command blocks or redstone can't create something as complicated as a working board game with multiple pieces and rules that are constantly updating. GREAT IDEA LET'S ALSO ADD TABLE TENNIS AND FOOTBALL ! wich items/block can be placed on it ? It will allow the players to do almost whatever they want, and that is the purpose of minecraft. I do agree with most of the people's thoughts here, it just isn't necessary, especially since people create things like this with command blocks. It would be cool, and I'm definitely more in support than I'm not, but I'd much rather other things be added. But mostly I just wanted to comment for a minor nitpick: Purpur was not named as a spin of purple, it's the name of a shade of purple in multiple languages. Yes! A really good hint. I really like this suggestion.